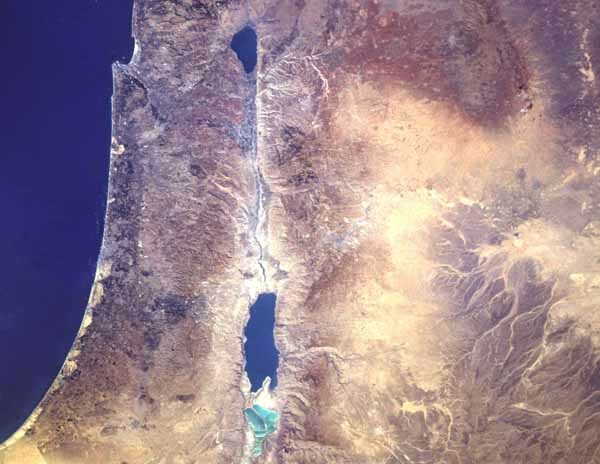 Tthe Jordan river flows from lake Tiberias to the north (see satellite pic below), through the the Jordan valley rift (part of the Great Valley rift) to the Dead Sea in the south. Nazareth was not on my route. After a week long trip to Eilat I returned to Hadera and had some time for people and event watching. Every time I re-visit Israel, I discover subtle changes compared to previous years. Although according to a poll more than 75% of the Israelis are content with life, there is growing discontent with the authorities and the government. The daily psychological strife with terrorism although for long being the Israeli way of life has been unabating and considerably more painful in the last 3 years. The security issue is however largely overshadowed by the real or perceived economical difficulties. These are greatly overemphasized by the local media with it’s marked socialist slant which intensely covers every labor dispute from the labor unions’ perspective. Any threat of large scale lay-offs in public or private enterprises is a cause for major headlines. On paper there was a tiny 2% decrease in the GDP in the last year (compared to 30-40% decline in the Palestinian territories). Granted the unemployment rate is high at over 10% (compared to around 6-7% in the US but 7-10% in the EU), and rising. The once thriving high tech sector which was not long ago the pride of Israel’s economy took a hard beat as the NASDAQ plummeted. Tourism has also plummeted in wake of the current wave of violence to less than 50% from the record-high of 2000. There is however hope. It seems that the GDP is poised to rebound with a 1.5-2% positive rate in 2004. Inflation has bottomed at 0-1% annually. Tourists which kept away due to security reasons have started to trickle back. But perhaps what strikes me the most is the changing face of the Israeli. More than 1 million Russians immigrated to Israel within less than a decade, now representing about 1 in 5 locals and making Israel’s population density comparable to India’s at around 230 people/ sq km (compare this to 35 people/ sq km in Europe, 29 in the US and only 6 in Canada). These Russians (Jews, Christians and mutts) haven’t relinquished their language which is now ubiquitous. Their culture is still separate from mainstream Israeli culture. Many shop in their own shops, drink their own wines, go to their own shows. The younger generation does however try to bridge the cultural divide and speaks both languages, serves in the army and in a way bring the Sabra and the Russians together. There was a large infusion of artists, musicians and engineers which have changed the social structure. Some found employment in their own occupation while most had to adapt to the new country finding new jobs in every walk of life (from government jobs to artists, shopkeepers, security personnel, realtors, mafia gangs and yes even pimps) . As a downside they also increased alcoholism, theft, gang fights and violence. Recently even some Russian neo-Nazi skinheads were uncovered. For all the good and the bad, overall Israel seems to be thriving in these inhospitable lands and is re-shaping its identity after each immigration tidal wave.